Info on where you can find the hidden Battle Star in Fortnite during Season 8 Week 7. In Fortnite, the Season 8 Week 7 challenges are available for all players, along with a new hidden Battle Star. Before jumping into your next Fortnite match, it can be worth taking the time to brush up on what the challenges are this week, and where you can find the hidden Battle Star. To help make things easier, we’ve put together a quick guide featuring all of the Season 8 Week 7 challenges, and where you can find the hidden Battle Star in Fortnite! A look at where you can find the hidden Battle Star during Season 8 Week 7 in Fortnite. In the image above, we’ve indicated the location where the Season 8 Week 7 hidden Battle Star can be found in Fortnite. Of course, before you head over there searching for it, you’ll first need to complete all seven of the Season 8 Week 7 challenges. If these haven’t been completed, you won’t be able to collect the hidden Battle Star. Below, we’ve listed all of the Free and Battle Pass challenges during Season 8 Week 7 of Fortnite! Visit all Pirate Camps in a single match (0/3). Visit Junk Junction and The Block in a single match (Stage 1 of 3). Deal damage with a pickaxe to opponents (0/100). Search Chests at Loot Lake or Snobby Shores. Eliminate opponents in different Named Locations (0/5). Deal damage to players from above (0/500). Deal damage to opponents while riding a zipline (Stage 1 of 2). After completing all of the Season 8 Week 7 challenges in Fortnite, you’ll automatically get a new loading screen which hints at the location of the hidden Battle Star. In the loading screen look at the backdrop to the left. There, you should spot the image of a rabbit. Near the rabbit’s head, you’ll also notice a Battle Star. 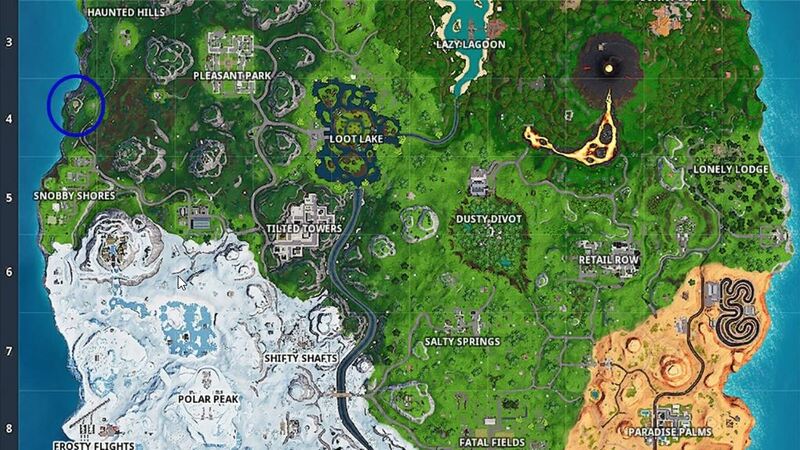 To help you further pinpoint the location of the hidden Battle Star, look at the map image above. In this area, you’ll find a wooden structure with the same rabbit image as seen on your new loading screen. To collect your hidden Battle Star, simply visit this location and interact with the image of the rabbit to get your Battle Star. Now that you know what the Season 8 Week 7 challenges are, be sure to check out some of our other guides including how to enable crossplay matchmaking in Fortnite, how to spawn weapons in Fortnite Creative, and how to use Account Merge in Fortnite.